Potawatomi Chief Alexis Menominee was born in 1791 at Twin Lakes, Indiana. In 1821 Menominee’s village consisted of three bark huts. By the time of the Removal period in 1838 it had grown to be one or the largest villages in northern Indiana with over 100 lodges (Schurr 2006). Menominee was most known for was his stubborn struggle to avoid removal. Menominee, like Pokagon, converted to Christianity and most of his teachings were Christian in nature. As a spiritual leader he preached abstinence from alcohol and the pursuit of an agrarian lifestyle. Also like Pokagon, Menominee felt that if they fit in with the white man’s culture they would avoid removal. In the earlier treaties Menominee, along with several other Chiefs, were relegated to a 22 section parcel along the Yellow River. Pokagon was able to successfully avoid removal by becoming Christian, but the government came to believe that Christian conversion was being used by too many tribes in order to remain. In 1838 Indiana Governor David Wallace ordered General John Tipton to remove Menominee to the reservation in Kansas. Eventually, he and 859 of his band was forced to move west of the Mississippi River. After over 60 days and 665 miles Menominee and his band arrived to the Osage River in Kansas. Forty-two of his group died on the trail and another hundred were reported missing. The journey was later called the Trail of Death. In March of 1839 they moved to the Sugar Creek Mission in Linn County, Kansas. They immediately erected a 40 by 22 foot church. Then with material they brought with them or found they erected shelters. 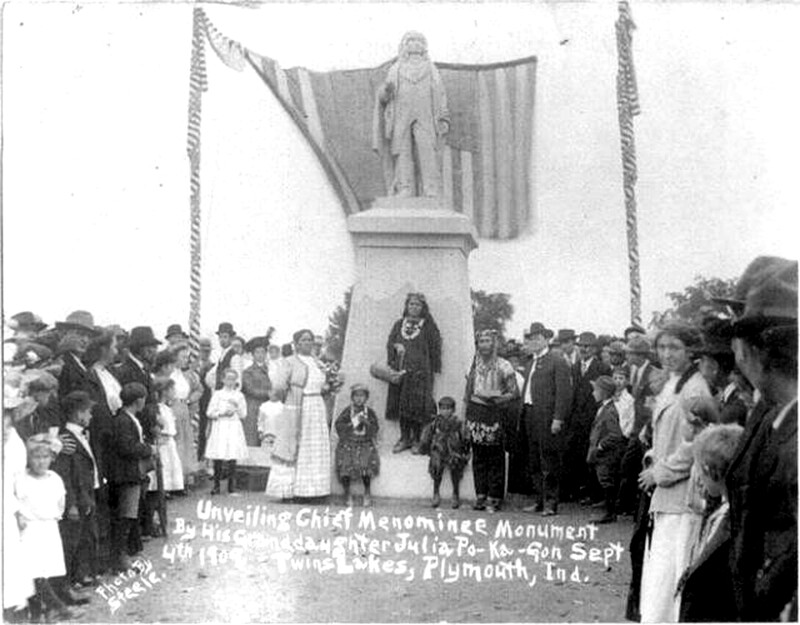 On April 15, 1841Chief Menominee died and was buried at Sugar Creek, Kansas. Chief Menominee is now long dead, but story of the Trail of Death lives with us as a blemish on our country’s conscious.